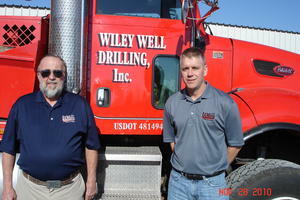 Wiley Well Drilling, Inc. is a 4th generation family owned and operated business established in 1945 by James Wiley. In that year, James purchased our first drilling rig on the day his son and current owner, Larry Wiley (left in dark blue) was born. Jack Wymer (3rd generation of the Wiley Family), Vice President ,is standing to the right of Larry. Larry has earned the coveted designation of "Master Ground Water Contractor" from the National Ground Water Association and is one of only three with that designation in Indiana and one of only 89 nationwide. The designation of Master Ground Water Contractor (MGWC) recognizes those who have proven exceptional knowledge and dedication in water well construction and pump installation. Jack is also certified in well construction and pump installation through the National Ground Water Association. Brendan Laudenbacher (left) is a water well driller licensed in Indiana and Ohio. He is the 4th generation of the Wiley family involved in the business. Wiley Well Drilling is a member of both the Ohio Water Well Association and the Indiana Ground Water Association. All of our drillers are licensed and insured. We have 7 dedicated full time employees ready to serve you. 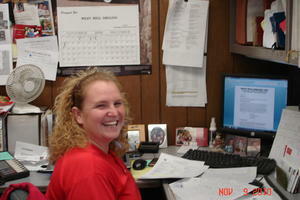 When you call, Chrissy - our Office Manager (right) - will be happy to schedule an appointment for you. Copyright © 2012 Wiley Well Drilling, Inc.